This week we’d like to introduce you to our current programming intern, Alex Sharma. Fun Fact! Alex was actually an intern with us before, and we liked him so much we had to bring him back. 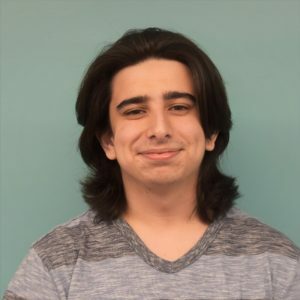 I’m a programming Intern, and currently I’m working a lot with James Spavold (Petricore’s CTO) on UI and also some systems work on the museum interactives we’re currently working on. Question #2) Where do you go to school? I attended Westborough High School in Westborough, MA and I’m currently a student at Becker College in the Game Programming Major. Question #4) What made you want to become a game programmer? I always knew that I wanted to make games, and I tried all different disciplines. When I first got here I actually wanted to do audio, but after some advice from another team member at Petricore I decided to pursue programming as a way to implement audio. At some point I stopped doing the audio aspect and ended up focusing more on programming. Question #5) You can copy the voice of one famous person, whose voice do you want? The comedian Joey Diaz, he’s got a deep Italian voice. I think that would be pretty funny. My favorite idea was “Mind the Arrow.” I’m mostly connect with “Traveling Merchant,” and “Battery Boy.” I got to prototype a few mini-games for Traveling Merchant, and then I was on Oliver’s team during the game jam that spawned what became Battery Boy. Question #7) Close your eyes and imagine that you’re standing in front of your dream home, it’s everything that you’ve ever wanted to live in, in the place you’d love to be. Tell us, what are you looking at? It’s by the water, that’s for sure. I hate colonial houses, but otherwise I’m not too picky. It needs to be different looking, a lot of glass and windows, a beautiful deck. Not too big, but very cool looking. Super Smash Bros Melee for sure, and I loved World of Warcraft as a kid. Question #9) Favorite toy from your childhood? 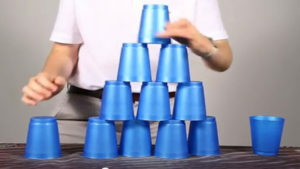 I got really into speed cup stacking when that was a thing, but otherwise I played a lot more video games as a kid. 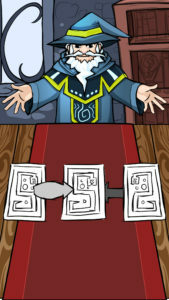 Question #10) Whoa a time portal has appeared, neat! You get to go back in time and work on any game from any time ever, what are you going to go work on? Super Smash Bros Melee was created in roughly only a year, and a lot of what makes it so good was seemingly made by accident. I’d love to be there to understand why they picked the things they did, and figure out what was planned from the start and what is actually an accident.